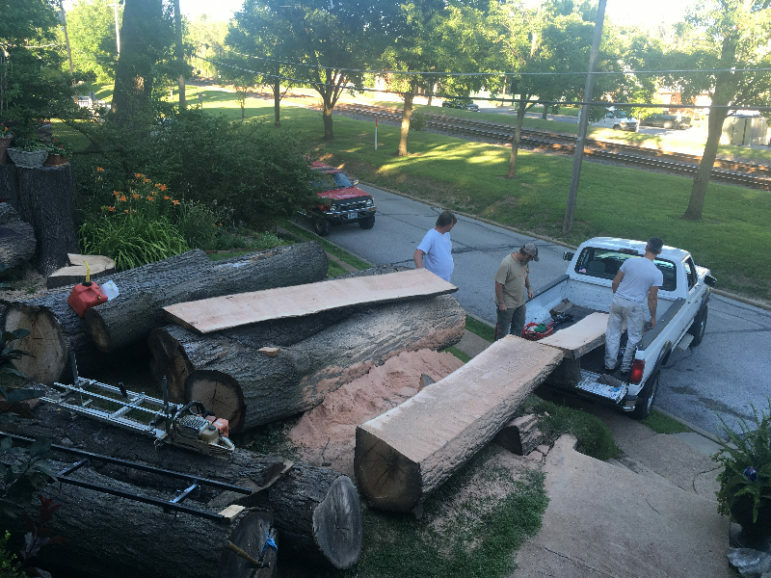 A potential danger became a fun family project for one Maplewood couple when they made the decision to cut down a red oak in their front yard. Patrick and Tess Duffey, on Arbor Avenue, had the massive red oak tree in their yard chopped down in the fall of 2017 because they feared it was diseased and could fall on their house if it fell naturally. 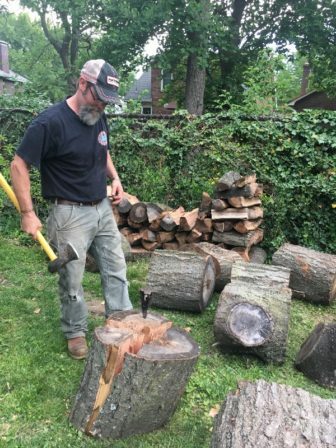 Patrick Duffey chopping the wood from the red oak (courtesy of Tess Duffey). Tess Duffey estimated the tree had been planted between 100 and 110 years ago, judging by the rings, just shortly after the house itself was built in 1904. Her husband, Patrick Duffey, welded and built his own version of an Alaskan saw mill, and has been using it to gradually disassemble the tree, turning it into lumber, firewood and other wood products to be used in the family’s own personal projects. “It’s attracted quite a bit of interest,” Duffey said, explaining that more than a dozen people had left notes on her porch or stopped by her house to ask about the tree. This felled giant has become a point of local interest, as well as an unusual but enjoyable activity for the Duffeys. Emma Trippeer is a home-schooled high school senior in Maplewood. Are the willing to sell some of the slabs? I have wanted to stop by and ask about the wood and the slabs they are making. It would be neat if they made some sort of table or seat out of the wood and kept it with the house as a momento of it being from the property.